Home / Methods / mutant amyloid precursor protein / presenilin-1 / radial arm water maze / RAWM / Using the radial arm water maze (RAWM) with video tracking. Using the radial arm water maze (RAWM) with video tracking. 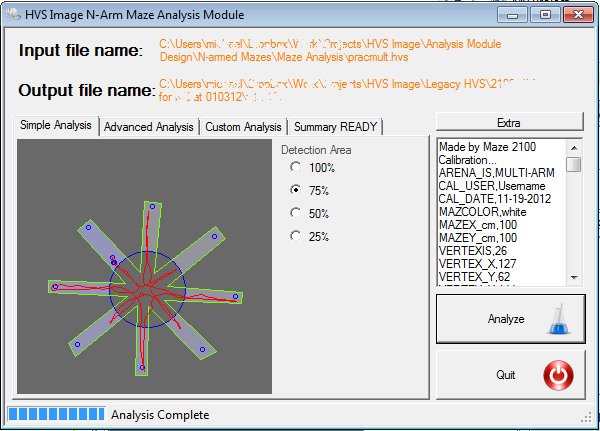 Interesting to see the HVS Image 2100 system being used for radial arm water maze (RAWM) by Nabar et al. (Cell Therapy: A Safe and Efficacious Therapeutic Treatment for Alzheimer’s Disease in APP+PS1 Mice). The radial arm water maze (RAWM) contains six swim paths or arms extending out of an open central area, with an escape platform located at the end of one arm. This is the goal arm. It seems that the RAWM has the spatial complexity and performance measurement simplicity of the dry radial arm maze combined with the rapid learning and strong motivation observed in the Morris water maze without requiring foot shock or food deprivation as motivating factors. HVS Image Radial Arm Maze Software to track and analyze radial arm water maze (RAWM).